Getting to know the Perth born red headed lady who was once an actress and now MP for Edinburgh North and Leith. Well, the 2015 UK election is over and the results north and south of the border have confounded the pundits. The Scottish National Party all but swept the board in Scotland while in England the collapse of the Labour and Liberal Democrat votes has led to Conservative David Cameron being declared the outright winner. There was never going be a clear victor we were incessantly told with the bookies giving odds of 1/16 on a hung parliament. If you had put your life savings of £16,000 on such an outcome expecting a quick return of a thousand you’d be as disconsolate as Ed Miliband, Nick Clegg and Nigel Farage who have all resigned as party leaders. A man in Glasgow was smiling after he bet £30,000 on the Conservatives winning a majority in the general election; he has pocketed £210,000. The pensioner made the bet at a city branch of bookmakers Ladbrokes 10 days before the vote, at odds of seven to one. Alex Donohue of Ladbrokes said the “well-groomed gentleman” was “the biggest winner of the general election”. He said many punters had backed a hung parliament, and lost out when the Conservatives won with a slim majority. The day after the election saw the Edinburgh Evening News with a full front page photo of the sun rising over the city’s Calton Hill emblazoned with the banner headline “YELLOW DAWN” set against a vanilla sky – the SNP’s clootie dumpling emblem forming the “O”. While the paper acknowledged the “Historic SNP landslide” the second page told of how “The Cam emerges after the storm” referring to the incumbent Prime Minister’s seemingly impossible triumph. Apparently Premier David Cameron had written four speeches during the night referring to coalition deals that might have to be done or even a possible second election in October. He was in the happy position of being able to tear these up as he found himself the undisputed winner. I live in the Edinburgh North and Leith constituency, a working class area encompassing the city’s docks that has long been traditional Labour Party territory. It was a seat that Labour might have been expected to hang to as in the 2010 election they had narrowly beaten the Liberal Democrats in to second place with the SNP’s Calum Cashley coming a very distant fourth. This time, however, Australian born Deidre Brock stormed home with a 5,597 majority on a 71.6% turnout after a 31.3% swing to the Nationalists. Perth (WA) born Deidre is an interesting character who was an actress in a previous incarnation. She was in two episodes of the long running Australian series G.P. as Doctor Bradshaw in 1995. She appeared in an episode of Home and Away and had a small part in the 1992 joint UK/Aussie film The Leaving of Liverpool which starred Oz film stalwarts John Hargreaves and Bill Hunter. In addition to her theatrical talents, Deidre is a councillor for the Leith Walk ward and is Depute Lord Provost of Edinburgh having previously been Convenor of Culture and Leisure for the city. Like fellow thespians Judy Davis and Val Lehman (Bea Smith in Prisoner) she was born in Western Australia, grew up in Perth and studied for her BA in English from John Curtin University before studying acting at the WA Academy of Performing Arts. On a holiday in Scotland she fell in love with the country and with her partner, Dougie, she moved here permanently in 1996. She ran the Parliamentary office of Scottish National Party MSP (Member of Scottish Parliament) Rob Gibson before she was elected to Edinburgh Council in 2007. Married with two daughters she has interests in theatre, netball, cinema, and traditional Scottish music and arts. She is a board member of the Edinburgh International Festival Council, the Centre for the Moving Image (Edinburgh International Film Festival/ the Filmhouse) and Creative Edinburgh. Deidre is also a member of the Transport & Environment, Education, Children and Families and Planning committees. The all night television coverage saw the dramatic change of the political landscape in Scotland set against the unlikely win of David Cameron. When pressed for a quick response from the BBC’s Kirsty Wark at around 2 am on the BBC election special SNP leader Nicola Sturgeon seemed what can only be described as disappointed despite her party’s stupendous performance. By then it was becoming clear that the Tories were going to be in a far stronger position than anticipated. The expectation had been that the SNP would be king makers in a hung London parliament with the most likely outcome seemingly an SNP coalition with Ed Miliband’s Labour Party. However, while not holding the balance of power they have now surpassed the Liberal Democrats as the third largest party in the Westminster Parliament. Back in 1974 there had been just 11 SNP MPs who were called the “football team” and now they have more than five times that number. Scottish First Minister Nicola Sturgeon has stated that she wants the Scottish Parliament to be given powers over business taxes, employment law, the minimum wage and additional powers over welfare. New SNP MP Deidre Brock when interviewed expressed concern over the rising amount of food banks in the North Edinburgh area and how it was important for the NHS to be protected and well-resourced. Outgoing Edinburgh North MP Mark Lazarowicz was a Labour back bencher who voted against the Iraq war of 2003 and argued in favour of a Middle East peace conference to settle the Syrian crisis. Deidre like the rest of her SNP colleagues is proud to wear the “Bairns not Bombs” badge arguing the £100 billion spent on the nuclear Trident programme should be spent on schools, hospitals and housing. 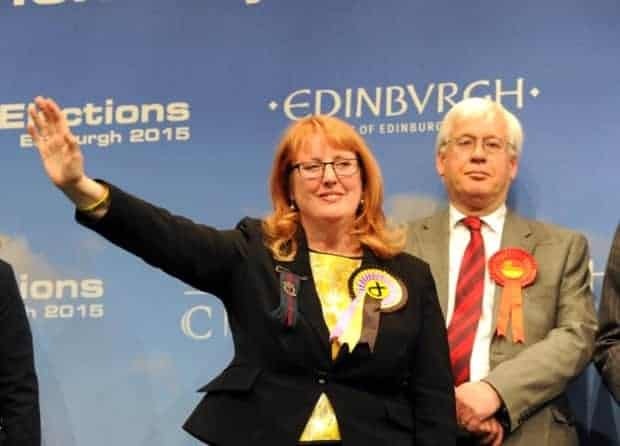 I enjoyed meeting the personable Deidre at a hustings and I think the folk of Leith and Granton will be well served by this red headed lady from the “City of Light”.